Scotland’s third National Planning Framework goes for Parliamentary approval Click HERE to read more. The Government have issued a position statement on the emerging Scottish Planning Policy. Click HERE to read more. Can you lose a development plan allocation? – Yes, going by a recent case. Click HERE to read more. Click HERE for an update on progress with Scotland’s local development plans. 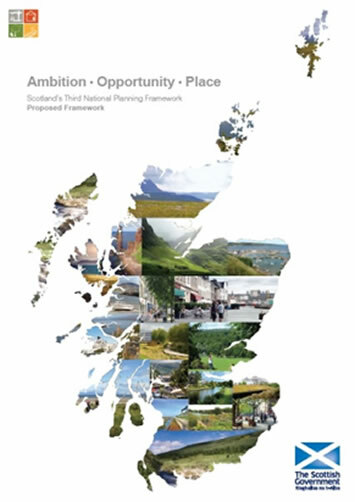 The Government has published its proposed new National Planning Framework (NPF) for consideration by Parliament : “Ambition – Opportunity – Place”. The NPF sets out the Government’s framework for the spatial development of Scotland over the next 20-30 years. Last summer, it consulted the public on the “main issues” on which the new NPF would be based, and that document gave a flavour of the new NPF. The document contains a four-part vision, and for each describes action today, tomorrow and the spatial strategy and priorities for change. The four parts are : 1 : “a successful, sustainable place” , 2 : “a low carbon place”, 3 ; “a natural, resilient place”, and 4 ; “a connected place”. Each spatial strategy includes the relevant National Developments. It will be remembered that this designation has the effect of approving the principle of these developments, and that subsequent planning applications deal only with the detail. The 14 National Developments are as follows. MIR : Main Issues Report (on which consultation took place last summer). Notable additions are Carbon Capture and Storage, a concept that the Westminster Government appear to have gone cold on; regeneration of Ravenscraig and Dundee Waterfront, both of which have appear to have stalled in recent years. The scope of “national development” at the central Scotland airports is broadened to adjoining commercial development. The proposed NPF 3 will now be scrutinised by four Parliamentary Committees, a process that could take three months. The Government intends to publish the finalised document in June. Scottish Planning Policy (SPP) is the other key document that, with the NPF (see previous section), sets the framework for development across Scotland. The SPP sets out national planning policies which reflect Scottish Ministers’ priorities for the development and use of land: it informs the content of development plans, decisions on planning applications and appeals, and how proposals are developed from conception to implementation. Over the last year, the Government has been consulting on a review of SPP. Unlike the NPF, SPP does not require to be approved by Parliament. However, given the important linkages between the two documents Scottish Ministers announced in September 2013 that both documents would be finalised in June 2014. This will enable the Parliament’s views to be taken into account where they are relevant to the SPP rather than to the NPF. To ensure that there is consistency between the documents and to support Parliament’s consideration of the NPF, the Government has now published a “position statement” on progress with the new SPP. This contains a response to all the issues that have been raised during the consultation – described as “considerations”, of which the following are significant. This would include replacing the Draft SPP principal policies on Sustainable Economic Growth and Sustainable Development with a principal policy on sustainability and planning therefore showing the concepts as compatible. That development plans reflect the presumption to reinforce the plan-led system; and that the presumption applies to decisions on planning applications if local development plans are out-of-date or do not contain relevant policies. This includes retaining a definition of generous land supply, providing a clear steer on the geography at which SDPs should express housing supply targets, and an appropriate policy on identifying a 5-year effective land supply. Can you lose a development plan allocation? The extent to which planning decisions are influenced by an emerging new local development plan has been in the news recently. The case of land owned by the Pilkington Trust at Huntingtower west of Perth, comes as a reminder that a development allocation for a particular use in an adopted plan does not necessarily continue into a new plan. The formal stages of local development plan preparation in the new Scottish planning system are Main Issues, Proposed Plan, Examination, and Adopted Plan. To these, most Councils have sensibly added an initial “Call for Sites” stage, sometimes followed by a consultation exercise; and in some cases a draft “Proposed Plan” can be seen before the council or committee meet to approve it. Some Main Issues Reports indicate which sites are likely to be favoured for development allocation. By the Proposed Plan stage it should be beyond doubt what the Council’s attitude is to the development of any piece of land in its area. At what point do such indications have a bearing on planning decisions? The traditional view was that no content of the plan ought to influence decision-making until it has been exposed to the rigours of public examination, but a recent case has questioned this. In the case of Pilkington v The Scottish Ministers, a site beyond the western perimeter of Perth was allocated for development in the adopted Local Plan and an application for its development recommended for approval by the officers. However the Council’s Development Control Committee rejected that advice for the reason that the application boundary (but not the proposed development area shown on the masterplan) extended beyond the allocation boundary, and refused the application. A few days after taking this decision the Council met to consider the draft Proposed Local Development Plan (LDP), which – like the adopted plan – designated the land as a housing allocation. At the meeting the Council approved the Proposed LDP but re-allocated part of the land from housing to employment use, the remainder becoming unallocated. Two alternative sites were added into the Proposed LDP as strategic housing sites in compensation. In the subsequent appeal against refusal of the planning application, the reporter found that the emerging LDP was a material consideration and that the appeal proposal’s conflict with it justified departure from the adopted development plan. She found that other matters – such as flooding and traffic impact – had been the subject of agreement between the Council and appellant and could be addressed by conditions and legal agreements. Nevertheless she dismissed the appeal for the reasons that : “conformity with the development plan is outweighed by conflict with the emerging local development plan. I also conclude that it would be premature to grant planning permission in principle for the appeal proposal in circumstances where the local development plan examination is likely to start in 4 months”. In an appeal to the Court of Session, it was submitted that the reporter’s decision was irrational since the existence of an emerging LDP was not of itself a reason to refuse planning permission. Since the proposed LDP had no formal status within the planning system prior to adoption, to take it into account was contrary to the government’s plan-led policy. To place weight upon it in preference to the provisions of the relevant adopted local plan was contrary to the terms and spirit of section 25 of the 1997 Act. While it was conceded that there could be situations where an emerging development plan could be taken into account in a planning decision, it was submitted that the land’s removal from the housing allocation of the proposed LDP was done without prior consideration and with no reason given within the minutes of the meeting, and that the removal of the appeal site from the proposed LDP was no more than a consequence of the refusal of planning permission by the planning authority. In his opinion on the case, Lord Armstrong considered that the Reporter had been entitled to consider whether the proposed LDP was a material consideration. He was satisfied that the reporter was entitled, for the purposes of her decision, to consider the Proposed LDP to be the planning authority’s “settled view”. The reporter had correctly considered the other infrastructure issues and attached appropriate weight to them. It cannot be assumed that just because a site is allocated for a particular type of development, it will continue to have the same allocation in a new plan. Taking this further, it cannot be assumed that even if a site is identified in the pre-plan stages and even in a consultation draft “proposed” plan, that it will automatically appear in the adopted plan. In the Pilkington case, despite already being allocated and continuing to be so in the consultation draft stages, the Council decided to remove it before the Proposed Plan was published. Land owners and developers should secure planning permission for allocated land before a Council has a chance to reconsider it! Don’t rest assured that it has an enduring development plan allocation. The case serves as a reminder that the Court of Session considers whether the process was carried out properly, and not the merits of the decision: as required by section 239 of the Planning Act. In this case Lord Armstrong found the Reporter had carried out the necessary considerations and made a judgement as to their importance in reaching the decision; and therefore she had correctly performed her duties and her decision could not be challenged. And finally – if you have an interest in the development of land, keep a very close watch on progress with the Local Development Plan. We understand that a further appeal is now under way. Main Issue Report consultation is underway at Aberdeenshire (closes 1st February), and Aberdeen City (closes 24th March). Proposed Plans are out for consultation at Clackmannanshire (closes 24th January) and Scottish Borders (closes 3rd March); while Moray Council meet to consider its Proposed Plan on 29th January so the consultation will follow afterwards. Plans at the examination stage are Cairngorms NP, Dumfries & Galloway, Inverclyde, North Ayrshire, Orkney, Perth & Kinross, Renfrewshire, Shetlands, South Ayrshire, South Lanarkshire and Stirling. Adoption : Dundee adopted its Local Development Plan on 5th December. This is the first plan that has completed the full “new” development plan process to reach adoption (one or two were hybrids from the old system). Coming soon : East Lothian MIR; Edinburgh – a revised or modified Proposed Plan; Falkirk Proposed Plan to Scottish Ministers; and a “Call for sites” expected for Loch Lomond and the Trossachs NP.